Sandvox 2 is coming in May! 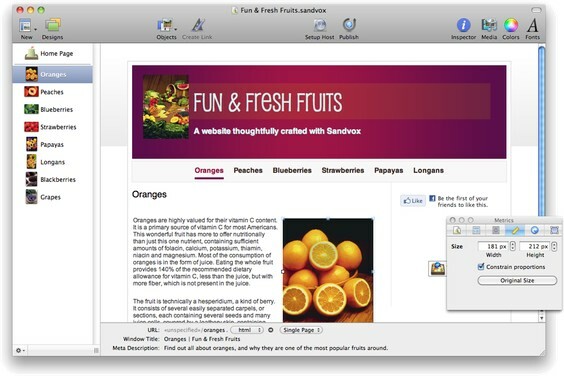 With Sandvox 2, the creation of interesting and good websites is much easier than with other software on the market. I will convert all my projects here in Germany to Sandvox 2. Now that I have been beta testing Sandvox 2, I can tell you that ... many of things I had hoped for are in the new program and without making the program more complicated or less reliable that it had been. I think one of the things I like best is the new streamlined approach. For instance when you want a new page, you don't have to worry about whether you want a collection or a single page. The same is true with the creation of Objects. You create the object you want, then decide where you want it. The program is also making good strides in the area of social media with Twitter and Facebook integration. Sandvox 2 has new features that make my life easier when doing a daily blog and quick snappy sites for animal rescue groups I work with. I know you will be thrilled by the new features in Sandvox 2 and pleased with the speed and ease of handling repetitious tasks. Check us out on Twitter and Facebook for more details about what’s coming in Sandvox 2!